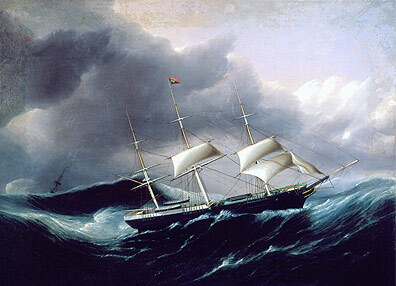 Penobscot Marine Museum has 24 works by marine artists Thomas Buttersworth, Sr. (1768-1828), Thomas Buttersworth, Jr. (1797-1842) and James Buttersworth (1817-1894). 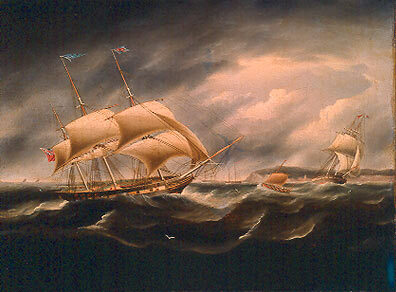 Thomas, Sr. was active as a marine painter in London from 1797 to 1827. He served in the Royal Navy and is best-known for his paintings of battles from the Napoleonic Wars and the War of 1812, such as the one described in the portrait of the HMS Endymion and the USS President. Less is known about his son, Thomas Buttersworth, Jr., and for years they were thought to be one person. The term for all ropes, wires, or chains used in ships and smaller vessels to support the masts and yards (standing rigging) and for hoisting, lowering, or trimming sails to the wind (running rigging.) Running rigging lines move through blocks and are not wormed, parceled, or served. or sailors working on board. James Buttersworth guides the viewer to focus on selected elements portrayed in his paintings. He is famous for his depiction of light.